Over the years, pets have played a significant role in the lives of millions of people. They are increasingly turning out to be a great source of companionship, which often helps in the mental well-being of the owners in this cut-throat world. Hence, it is understandable that people are willing to spend more today on their pets’ well-being than ever before. This is because pets act as stress relievers while also providing some much-needed comfort to the owner in an increasingly secluded world. Moreover, increasing income means that now people are in a much better position to provide quality health care to their pets. The level of pet health awareness among the owners has surged exponentially over the last few years, giving rise to a demand for more effective and scientifically advanced technologies for pet well-being and the development of new and advanced equipment. In this regard, pet wearables have turned out to be major winners with their easy-to-use but high on value offerings. As per a recently conducted research, “The global pet wearables market is projected to witness a compound annual growth rate of 11.02% during the forecast period to reach a total market size of US$2.712 billion by 2023, increasing from US$1.448 billion in 2017”. The major factor which is expected to usher in this type of growth is the technology for medical diagnosis of pets which is expected to propel the market size for medical treatment related pet wearables from 1% to 13%. At this point, from a geographic point of view, North America is the market leader concerning pet wearable purchases. North America is closely followed by Europe at number two in the charts. In the next five years, the markets of Asia-Pacific is set to exhibit highest rate of growth as a greater level of awareness is reached among the populace of this region regarding health and fitness activities of the pets. However, it is unlikely that the leadership in the market will change hands in the next five years. Factors such as increasing adoption of animal companions, higher-level of disposable income and higher per capita healthcare expenditure, in the region will see North America continue its dominance in the market for the foreseeable future. Sophisticated technologies, latest innovations and a high number of pet health aware owners who are tech savvy will also play a major role in driving the growth of the market for pet wearable in North America. The power of the Internet of Things (IoT) has a significant role to play in the development of such advanced equipment. This technology enables pet owners to effectively track the day-to-day activities of their pets. It facilitates activity tracking, heart monitoring, respiratory rate checks, while also allowing tracking calorie burns and rest patterns of cats or dogs. Data related to food intake of the pets is generated for better health analysis and diet control. Other advanced technologies like GPS trackers, motion sensors, RFID sensors, accelerometer sensors, camera, transmitters, Bluetooth and antennas are combined to optimize the performance of wearables to produce accurate data. In the future, IoT will be leveraged to an even greater extent to help transmit valuable information about pets’ health to the owners as well as the veterinarians. The market will also receive a boost in the immediate future as the combination of data analytics, mobile apps and pet wearable look set to add a new dimension to the value-based care system. Technologies like GPS and RFID have become vital components of the industry and are being leveraged to make better offerings. GPS powered tracking devices can be instrumental in finding missing or stolen pets. Due to its utility, the popularity of GPS tracking devices has soared. The demand for these devices is expected to grow at the CAGR of 14.8% approximately between 2017 and 2025. RFID, on the other hand, allows for a complete redesign of the traditional process. The use of this technology can facilitate higher productivity, reliability, transparency and most importantly greater accuracy. Using RFID in tandem with sensors can significantly improve pet health consistently and accurately by tracking the health parameters like temperature, HRV, monitor pulse, respiration, etc. Although, this is a sector which is relatively new, yet, there is already severe competition in the market, prompting companies to employ dynamic strategies like innovative product development, frequent launches, collaboration and acquisition to increase their hold on the market. In addition to these, many pet care and insurance companies are also heavily investing in this industry to help the owners take better decisions for their pets. The efforts of these companies have seen many small developments as well as some major developments in the recent past. One of the biggest development was witnessed in the early part of 2017 when wearable devices for dog activity monitoring were introduced with an intelligent data platform. This was a result of RSA insurance group’s investment in a company called PitPatPet. Apart from this, another breakthrough development came in the form of Open- Q 2500 System on Module, also known as SOM, and it’s Open-Q 2500 Development Kit. This introduction took place in June 2018 and was powered by Intrinsyc Technology Corporation. The SOM has transformed the Android-based wearable device experience for the pets by combining performance with connectivity. 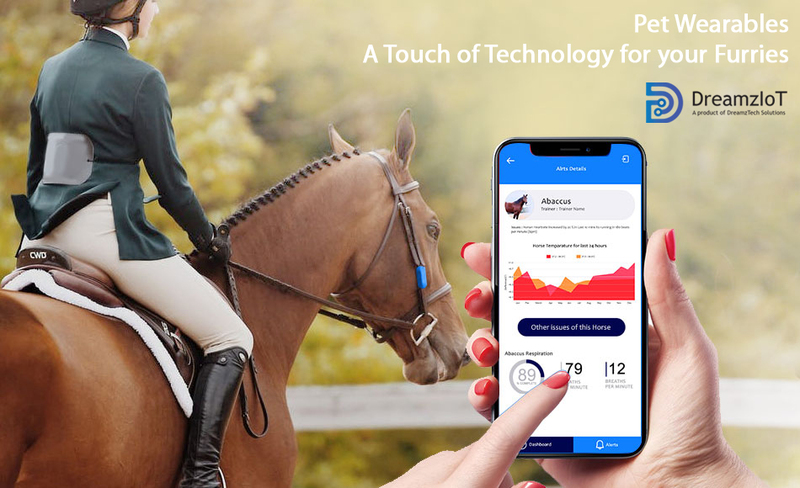 DreamzIoT Pet Solution is a pioneering transformation of the industry by leveraging technologies like Blockchain and Artificial Intelligence, while also further enhancing the use of Internet of Things, to help pets live longer and healthier lives. These endeavours have already started yielding results in the form of gadgets, that help track pet activity, temperature, heart rate, respiration, positions etc. The potential for this industry is immense today, and with increasing awareness and investment capacity among the pet owners, the possibility of reaching greater heights is almost inevitable. At the same time, the path to success is not free from hurdles, none more significant than the challenges posed by battery life issues. At present, the problem of high power consumption and low battery life is maligning the otherwise clean image of the pet wearable gadgets. The devices which are available in the market mostly run on lithium-polymer or lithium-ion batteries. Hence, their lifespans typically range from two to three years. Due to their shelved lives, the cells deteriorate almost after every charge cycle. Moreover, deep charge and overheating cause other issues in the functioning of the devices. This is one issue which has the capacity to impede the market growth of this industry. Efforts are in process to find an alternative to counter this problem, which will make these gadgets much more sustainable.